Home»Does the Federal Funds Rate Affect Mortgage Rates? This graph contrasts the movements of the weekly average Federal Funds rate against the movements of the weekly 10-year Treasury Constant Maturity and those of the average 30-year fixed rate mortgage and 5/1 Hybrid ARM. It covers a time period of the last three years. For more about Fed Funds, mortgage and other loan rates, click here. 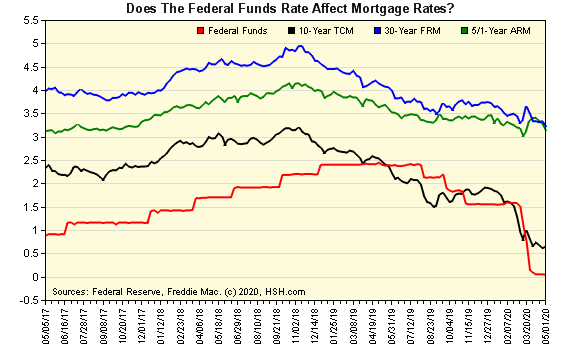 The ultra-short-term Federal Funds rate -- an overnight lending rate between banks -- has little direct influence on longer-term rates, such as those found on mortgage loans. These are more likely to be influenced by moves in longer-term Treasuries, such as the 10-year seen above.